Forged Steel Heavyweight Bullhorn Jointer Heavyweight, forged steel Concave joint ..
Square End Magnesium Bull Float with Threaded BracketTop surface coated Bottom uncoated U..
1 3/4" ALUMINUM BUTTON HANDLE - 6'Made of thick anodized aluminum to prevent hands from turning blac..
Wood FloatMade from redwood Plastic handleDimensions: 12" x 5" x 3/4".. 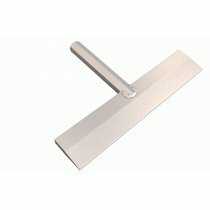 Stainless Steel Curved End Concrete Edger with 3/8-Inch Radius and 1/2-Inch Depth Wood HandleUsed to..
Thinline Magnesium Float from Bon ToolSquare End Cast Comfort Grip HandleDimensions: 16 x 3 1/8"&nbs.. Stainless Steel Hand Concrete Groover Single End6-Inch by 3-InchStainless steel1/2-Inch bit depth by..
7” Heavy Duty Floor Scraper. Heavy-duty scrapers for removing old floor or wall coverings. ·&..